The Cleveland Mashie has my interest in a quest for a new hybrid. 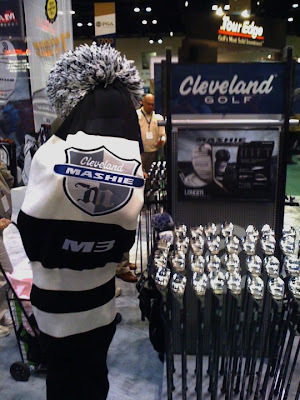 Reviews of the Cleveland Mashie have been plentiful some of the better ones are at The Hackers Paradise and GolfWRX but it's still not available. The release date looks to be Feb. 18/2011 here in Canada (Although I'll check Golf Town again this week). This week's PGA Merchandise Show had many raving about the Mashie and some great pics of the club and it's unique head cover are everywhere. What I like so far from what I've seen and heard about the Cleveland Mashie is the amount of available lofts and specs, five different lofts: 15.5°, 18°, 20.5°, 23°, and 26°. Something for everyone. I'm also curious to see the Retro-Raw finish. Designed to provide a rugged, bulletproof look that encourages the versatile, go-anywhere playing style for which the Mashie is designed. Thirdly a great light shaft offering from Miyazaki. The lighter Miyazaki C. Kua 59 series premium hybrid shaft dramatically reduces total club weight while preserving stiffness and stability, resulting in faster headspeed and longer carry. Looks like the price will be right at $169.99 here in Canada at Golf Town. Buy it !! It is my favorite club after only 2 days in the bag.